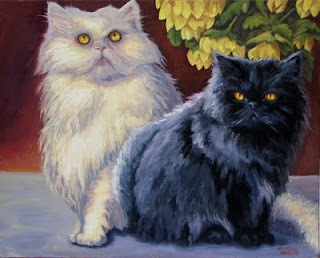 Samson and Delilah live the pampered lives of Persian cats well-kept by their person. And it's pretty obvious, upon meeting them, as to whom is in charge. What's that they say, "Dogs have masters, but cats have staff." They didn't exactly pose for this portrait; I had to sort of follow them around and catch them at odd moments, laying on my belly with camera in hand, waiting for the right pose, the perfect "look". I thoroughly enjoyed getting to know these two aristocats as they "talked" to me through the paint. When their eyes "speak" to me, I know I'm close to capturing them on the canvas. The title comes from an old Simon and Garfunkel song, which is fitting considering the song was popular about the time the photo was taken. The little girl is now a woman and the lovely dog is, well, gone to heaven where all good dogs go. I have to admit that I pretty much manufactured the background in the painting. It's much more romantic than the actual background in the old photo, and adds to the idea I was going for here. 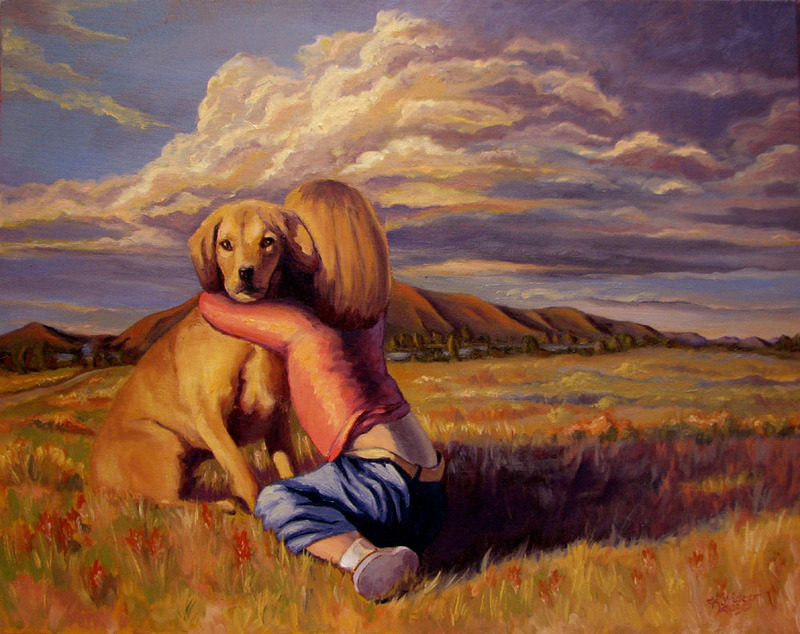 My inspiration is the devotion little girls feel for their dogs, and the unconditional love they receive in return. Dogs love their little girls, literally, unto death, and think nothing of giving themselves completely to the care and protection of their charges. Nothing in the whole wide world would willingly separate them. That sort of innocent love exists only for the pure of heart, such as between a little girl and her dog.